So, have you guys seen those Groupon Ads yet? You can hardly visit a blog anywhere on the web without seeing them. The ads claim you can get services, dining and “stuff” for up to 90% off in your local city. Heck, I’ve even got a Groupon ad up on my own site, courtesy of Google Adwords. I didn’t pay any attention to Groupon for months. I kept seeing the ads, but barely spared them a thought. Finally, yesterday, I clicked on one. And boy, was I impressed with what I saw. 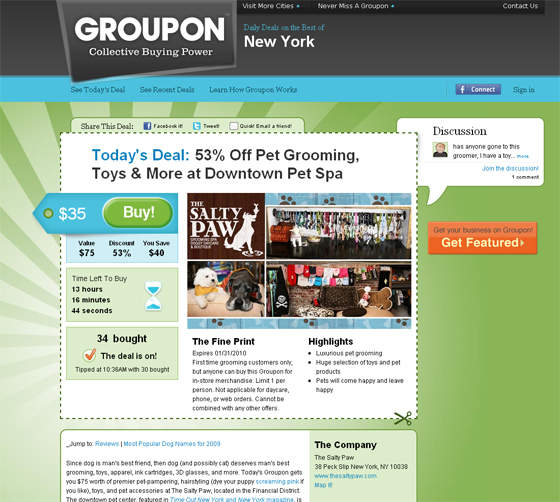 Groupon works by purchasing large quantities of coupons from local (to you) business. Restaurants, bowling alleys, spas, classes, carpet cleaners, outdoor outfitters…the wide variety of businesses and services selling to Groupon is impressive. Once you sign up with Groupon and let them know where you’re coming from, you get “A Deal A Day” from your area. And there are some really awesome deals; all are at least 50% off. Many are discounted way more than that. Groupon earns money because you “buy” the coupon from them. Everyone wins here: the business gets loads and loads of customers, you save at least 50% on a product, service or meal you wanted anyway, and Groupon earns enough to keep offering these amazing coupons. So, what kind of deals are we talking about here? For instance, today’s deal for Detroit was $59 for 2 rooms of carpet cleaning and 2 coats of protective finish from OxiClean. Ok, not exactly my cup of tea (even though the OxiClean claims to be ecofriendly), but let’s look at the deal. This would normally cost $118. You’re getting this service for 50% off. If you were going to get your carpets cleaned anyway, this is a pretty great deal. You would then pay Groupon the $59, and schedule your appointment. Simple. Another recent Detroit-area deal was $20 for 2 dinners and 2 tickets to Late-Night Comedy at Andiamo. This would normally cost $50. So you saved $30. Over 2,500 people bought that Groupon in the Detroit area. Groupon has over 9 million active members. And they’ve been featured in The Wall Street Journal, ABC News, the Today Show, Fast Company, CNN…the list goes on and on. Forbes has dubbed Groupon “The Fastest Growing Company Ever”. And with good reason. It rocks. You can check out the segment Good Morning America did on Groupon here. Ok, so I guess I’m a little slow on the uptake. Apparently Groupon has been taking the world by storm and I’ve somehow missed it until yesterday. Any of the Groupon links in this article will take you to the site to sign up (although I think they might all take you to the Detroit area Groupon). Because Groupon automatically picks up on where you’re coming from, you might have to change the city. You can also earn money on Groupon. If you refer a friend to Groupon and they sign up, you get $10 Groupon bucks to spend on a deal. You can spread the word through links, Facebook, Twitter and email. The coolest thing, I think, that Groupon offers is that it exposes you to businesses and restaurants you might have never heard of before. For instance, I had no idea that Andiamo Comedy Club existed. There was a deal back in March for Ackroyd’s Scottish Bakery in Redford. Sounds deliciously amazing, and I had no idea the place was there. Now I want to go check it out! So, Groupon allows you to kind of play tourist in your own city. It exposes you to places and events you might have never heard of. And it enables you to go out and have fun (or buy services) for far less than you’d normally have to pay. There’s even a guy who’s travelling the country and living entirely off of Groupons. Yes, of course he’s blogging about it, at LiveOffGroupon.com. I’d love to hear back from you guys on this. Have you used Groupon? Have you scored any amazing deals, or discovered a new place or event because of the site? I’d love to hear about your experiences with Groupon, if they’ve been good or bad. So send ’em in! In addition to the referral bonus they have “Groupon Scouts” they send surveys to. I think they have to invite you to become a scout, but you get $5 groupon bucks for each survey. Add those up and you can get some of the deals basically for free. There’s also another site that works like Groupon. It’s called Living Social, you should check it out. I think both sites do a good job of putting a variety of coupons out there. Groupon is a great way to save money, and it’s so easy to use. Now, with other sites offering even more groupon-like opportunities and daily deals to save, there’s no reason NOT to take advantage of these deals! http://www.dailydealpool.com is another site that is great to use for saving money, and easier than Groupon. It sends you the local deals in your area directly to your inbox daily, so you don’t have to search for what you’re looking for or what’s available. Groupon and daily deals are making is quick and efficient to save money. I love Groupon. Living Social has been great to me, too! I just bought my first one yesterday! Door to Door Organics. A box full of local, fresh organic produce delivered to my door for $16. And Groupon, weirdly enough, sent me a $10 coupon (not sure why) so it only cost $6. Awesomeness! I’m officially in love with Groupon. I like groupon and have subscribed to it. But living social is also starting to offer some great deals. But as competiton grows I wonder how many sites like this will spring up.